If you are a car detailing nut like me, then you'll agree that there's nothing like the smell and feel of the leather in a brand new car. 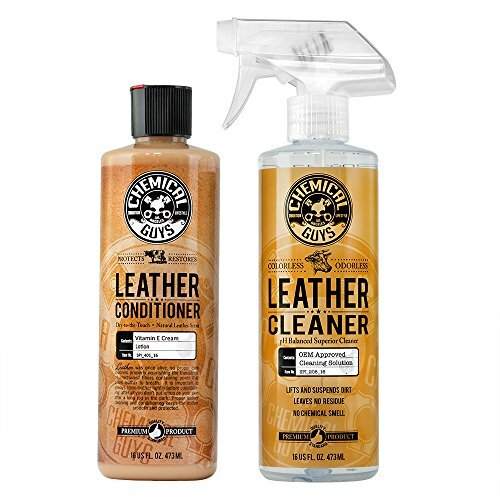 The best car leather cleaner you can buy at the moment is the Chemical Guys Leather Cleaner and Conditioner Kit . Check out the detailed reviews below to learn more. Unfortunately, leather cleaning is one of those things that confuses people. Leather is actually really easy to maintain. You just need to steer clear of cheap kits or home made cleaners and choose a good quality cleaning product. Why should you use a car leather cleaner and conditioner? What's the difference between Car Leather Cleaner, Conditioner and Sealant? What are the different types of car leathers? With this combo, you can effectively clean, condition, restore, protect, and prolong any leather surface in your car. And if you like, you can also use it on the leather in your home too. No matter what type of leather product you have whether it's Aniline, Semi-Aniline, Full-Grain, or Corrected Grain, this cleaner from Chemical Guys will safely clean it. You also don’t have to worry about color bleach or surface damage. As it's a PH balanced formula, it gently removes grime, dirt, dust, oil and common stains without damaging the leather finish. Check out the video below to see how it works, but in my experience, to protect new seats, leather trim or to revive older leather, it's as simple as few sprays of the cleaner followed by a wipe with a clean cloth. A really important aspect of leather cleaning is the smell that is left behind. This cleaner doesn't really smell of anything like leather. The conditioner leaves a faint leather smell that remains in the car for a few days at most. If you read through the reviews left by customers it appears that this is also a fairly innocuous cleaner. So whilst it will do a good job cleaning the leather in your car, you don't need to worry about it causing allergies or itching, or damage to your clothes. This kit requires you to carry out a bit more work, as the cleaner and conditioner are separate in separate bottle. But this is a good thing, as you won't always need to use the cleaner. To get the best results, you first use a brush (preferably a horsehair brush) or cloth to remove any loose dirt or food particles. Next, you spray the cleaner on a microfiber cloth and rub it into the leather. Once the dirt has loosened, wipe it off, along with the excess cleaner with a new microfiber cloth. Lastly, you need to apply 1 to 3 lines of conditioner and spread it using a clean cloth with delicate massage motions so that cream goes deep into the pores of the leather. This will restore and protect the appearance of the surface and make it silky, soft and smooth. Overall, this is an easy to use kit that will not only protect new leather, but help to restore old leather too. I like the fact that it's as simple as spray on and wipe off. It dries out matt (no nasty glossy finishes) and it leaves a faint, but not overpowering fake leather smell. If you are a fan of the Chemical Guys products like I am, then this one won't disappoint. Check out the guys themselves showing off the kit in action. 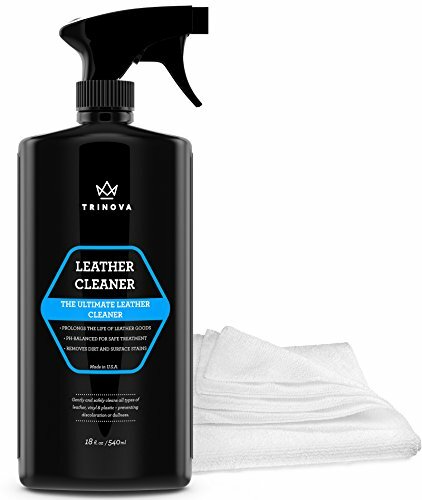 This leather cleaner from Trinova is a jack of all trades. Not only does it clean leather, but it can also be used on lots of other surfaces too. If you check out the reviews, it's also particularly good at cleaning white/ light colored leather. Just spray it on and it will wipe off almost any surface stain. Is it safe to use on all types of leather? 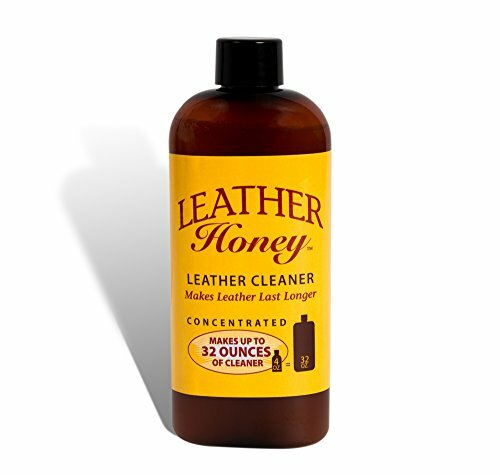 Like most leather cleaners on the market, this one contains no harmful chemicals. Trivona claim that you can safely clean all leather types as well as vinyl, saffiano, compound, durable, faux among other surfaces. It can also be used on both dark and light color leather surfaces without worrying about fading or discoloration. It's also particularly good at bringing light colored leather back to new. If you want to, you can dilute it slightly to make it last a bit longer (or if are paranoid about it damaging the leather). But to be honest, using it straight out of the bottle will give the best results, especially if you are trying to remove stubborn dirt, stains, grime, and oil on your leather seats. I also found it was good at clearing up light surface scratches. Depending on the color of the leather, you will notice them less after cleaning. Once it dries out there isn't really much of a leftover leather smell. It leaves a faint fake leather scent, but like the Chemical Guys conditioner, it doesn't hang around for long. It's also worth noting, if you get this stuff on your hands, it won't irritate them or leave a smell. Even though this is technically just a leather cleaner (and not a conditioner), it still leaves a nice natural matte finish. It definitely seems to moisturise the leather leaving it soft, supple, and smooth to touch. I'd still recommend using a conditioner after cleaning any leather. It will help to keep the leather clean and protect it from UV fading and cracking whilst helping to extend the life of the finish. If the leather surface is fairly clean to start with, this stuff will work by simply spraying onto a microfiber cloth and rubbing it into the leather in a circular motion. If the leather hasn't been cleaned recently you're going to have to wipe it down with a damp cloth first and maybe give it a once over with a horsehair brush. Overall, this appears to be a really effective leather cleaner that has the added bonus of working on a multitude of other surfaces too. It's also safe to use regularly and won't damage the leather finish if used every two months or so. The only downside is that it doesn't contain any leather conditioner, so you're going to have to spend extra on one. Leather cleaners made purely from natural ingredients are pretty rare. Chamberlains Leather milk leather and conditioner is made purely from a blend of oils and water. This means it's a non-toxic and PH balanced cleaner that promises to clean, restore, moisturize and protect leather. It also comes in a cool old style bottle, that I think gives it a that classic natural look. Is it safe to use on all leather types? This stuff is not strictly a cleaner, it's more of a conditioner slash rejuvenator. However Chamberlains, do claim that due to it's natural composition and the way it interacts interacts with the leather it can be used to clean, condition and refresh leather items such as bags, shoes, boots, luggage, purses, saddle/tack and of course car leather. They also say that this particular mixture of oils is really well suited to lighter and unfinished leather. This makes it the perfect choice for light colored car interiors that can get really grubby over time if not cared for. It also leaves a soft cherry like smell once it dries out, different to the fake chemical like leather smell that some other cleaners leave behind. There are so many leather cleaners out there that leave behind a shiny finish, and this is what some people think is what clean car leather should look like. Wrong! There are lots of different types of leather finishes, and its important to use the right product. 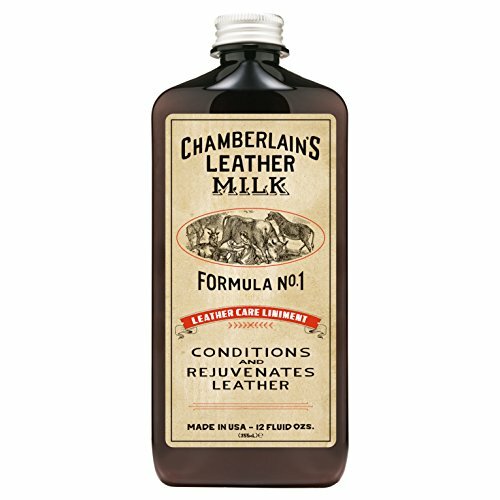 Chamberlains Leather milk is more of a conditioner and leaves a dry, non-greasy matte finish. This is the type of finish you want in you car leather. Preparing the leather for cleaning is equally as important as the cleaning/conditioning process. Chamberlains recommend preparing the leather by brushing with a soft bristle brush to remove dirt and debris from the crevices, cracks, seams and to loosen up dust in the pores. Then you can apply the conditioner with a small microfiber cloth or cleaning pad (there's one included). Simply wipe the surface to remove dirt and stains. Once you've finished rubbing in the cream, remove the excess with a clean and dry side of the cloth. I haven't used this product regularly myself, but going by the reviews, it's enough to use this stuff 2 to 3 times a year to keep your car leather looking like new. Obviously this may vary depending on where you live, if you have a convertible or kids and dogs. 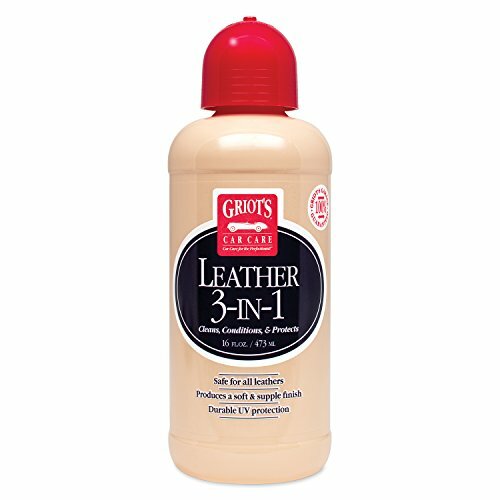 If you want to clean and protect new (or newish) leather upholstery, this 3-in 1 cleaner from Griot's Garage is a great option. It's part of a range leather cleaning products from Griot's Garage, this one best suited to new leather or leather that is in good condition. You can of course use it on all types of leather, old or new. Like a lot of other cleaners on the market today, the Griot's leather cleaner can also be used on your faux leather and vinyl. Griot's say that since it's a non-toxic cleaner, that goes deep into the pores of leather, removing all dirt and stains and won't damage the leather surface over time. It also won't react with the dye or leather texture. Due to it's creamy conditioning texture, this product leaves the leather feeling non-greasy, supple, and smooth. It dries in pretty quickly (in about 30 mins), and leaves a nice natural matte finish. It will to some extent revive cracked, dry and worn leather, but it's much more effective on newer leather. I'll be honest, I haven't used this product personally, but it appears to be really easy to apply. The general consensus is less is more with this one so you should be able to treat and clean the entire interior a couple of times with just one bottle. Check out the video below to see it just how easy it is to use, and how well it works. Freshens leather and leaves a unique scent! 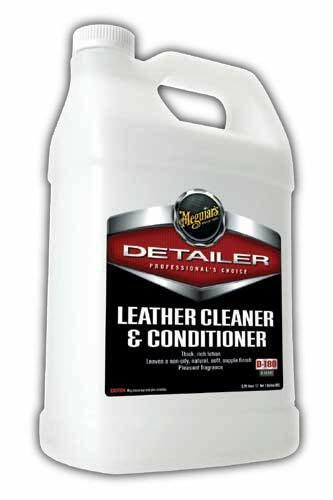 Meguiars Leather Cleaner is a popular choice among pro detailers and bodyshops. It comes in a large 1 Gallon bottle, so it's a great option if you clean a lot of leather, as this stuff goes a long way. Just like the vast majority of leather cleaners on the market today, this one can be used to condition any type of leather commonly used in a car. It's even safe to use on softer leathers that can be easily damaged. Unlike some other leather cleaners/conditioners, it won't affect the color of the leather, and keeps the original color tones intact. Going by the numerous reviews online it appears to be more of a leather conditioner than an effective deep cleaner. So if your seats are really dirty to begin with then you are going to have to use a cleaner first. It does however help to enhances the color of worn leather and prevents it from further fading. Like many leather products on the market today, this one leaves a strange scent. It's not overly pungent, but just not very leathery. One reviewer has described it as smelling like the little tree black ice air freshener, so if that's your sort of thing then you'll love this! As it's more of a conditioner than a cleaner, you can expect it to soften leather and restore flexibility. It also leaves behind a UV resistant coating that helps to protect the leather from direct sunlight and discoloration. How often do you use it? How long does it last? If your maintaining leather that has been well looked after, then it's enough to use this a couple of times a year. If your car leather has to put up with a lot of abuse then you might need to reapply every 2-3 months. Either way, a gallon is going to last a long time. Just like all of these leather conditioners, it's very easy to use too much so remember a little goes a long way. It's probably a good idea to work from a smaller bottle (maybe even a spray bottle) and apply it with a good quality microfibre applicator pad. This top rated leather cleaner comes in concentrated form and is safe to use on all leather types. The 4 ounce bottle will make up to 8 times its volume, meaning there should easily be enough to clean the entire leather interior of a decent sized car. Using it couldn't be simpler, just dilute (2 teaspoons per cup of water is recommended) and apply to a microfibre cloth. If you've got a spare spray bottle this is an ideal way to mix the solution and also makes it easier to apply to the leather. Since it's water based and non toxic, it's safe to use on most leather and vinyl surfaces in the car or around the house. Leather Honey also produce a leather conditioner, and this is a great way to finish protecting your car leather once you have cleaned it. We wouldn't always advocate using an all in one leather cleaner and conditioner, but this one is a great solution if you are short on time. 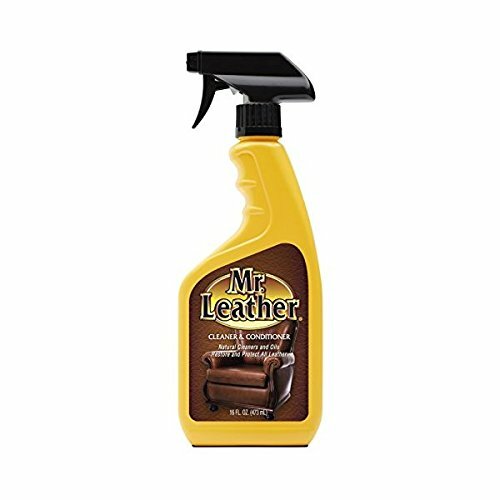 Unlike a dedicated leather cleaner, Mr Leather contains a conditioner too. This means that it will clean the leather and leave behind a water repellant protective coating that will moisturise and soften the leather material. It comes ready mixed in a handy spray bottle, so there is no messing around trying to dilute it, you just spray onto a cloth and rub into the leather surface. The 16 ounce bottle should be enough to clean a car interior a few times, and there is no wastage as any unused product is easily stored until next time. You can use Mr Leather on virtually all leather surfaces, fake or genuine. It's also safe to use on leather bags, purses, coats, shoes etc. Just be sure to try it on a small area first to make absolute sure the surface can take it. Many people don’t believe in dedicated leather cleaners and conditioners, especially the conditioners. Car leather is a lot tougher than you may think. The leather on a handbag or even a jacket is going to wear a lot quicker than leather in a car. In fact, there is a whole industry out there dedicated to creating long lasting beautiful leather for use in the auto industry. So in reality, especially if your car or truck is a recent, mainstream model, you’ll find that the leather is going to be easy to maintain and won’t need a whole lot of elbow grease to keep it looking new. The problem however, is as the leather starts to age, very small cracks will start to appear in the protective surface as it starts to wear away. Depending on the color of the leather, these may be invisible to begin with. It’s at this stage that regular cleaning and conditioning of the leather becomes very important. No matter how well you take care of it or how often you clean it, leather will wear over time. How quickly this happens depends on lots of things like the climate it's exposed to, the clothes you wear (jeans, buckles and buttons will cause more wear) and what you are using to maintain the leather. Dedicated leather cleaners and conditioners are made from PH neutral chemicals and oils. They will not further damage the leather any more than your behind sitting on it will! But will be strong enough to help shift dirt and stains without removing any more of the protective coating. There are lots of cleaners on the market that can be used on all interior surfaces. These are really handy if you are just giving the interior a quick clean and you’re probably safe enough using them on most newer, protected leathers. The problem I’ve always found, is that universal cleaners usually cause the leather to dry out shiny. This isn’t because they’ve damaged the leather, but usually because they leave behind a temporary ‘protective’ skin. On the other hand, a dedicated leather cleaner will clean away any dirt and won’t leave behind any residue. So what you are left with a nice ‘natural’ matt leather surface. Sometimes differentiating between the vast array of leather products on the market can be difficult and confusing. Some leather products are cleaners, some are conditioners and some claim to be both. Then there's leather sealants, serums and protective coats. Are they all the same? Are they all necessary? This is usually found in the form of a spray and is used to clean dirt and oils from leather. They can be used with a cloth, microfibre pad or even a soft brush if the leather is really dirty. A good quality leather cleaner will leave behind no residue or shine. Make sure you choose a PH neutral water based one, that is kind to the environment and to you cat leather. A car leather cleaner is a creamy liquid that is applied to clean leather to keep it supple and soft. The best type of leather conditioner is one that will dry out matt and won't leave behind any residue or a shiny, oily finish. Car leather sealant adds a protective layer to the car leather surface. This protective leather will protect agains spills, staining and UV light damage from the sun. Some leather sealants will last an entire year between applications. It's important to only apply a leather sealant to clean, dry leather. Be sure to try a leather sealant on a small inconspicuous area first, as most sealants will leave behind a scent and will slightly alter the finish of the leather. You will want to be sure it looks ok when fully dry. Unfortunately there is a whole ton of false information out there when it comes to auto leather types and finishes. I don’t know is this to create confusion to sell more leather cleaning products, or is it just lazy copycat writing (the internet is full of it you know!). Anyway, even if your car is 20 years old, its leather interior almost definitely left the factory with a protective coating. If your car is an older high end, luxury car it may have aniline or semi-aniline leather. This type of leather is softer and feels more natural, but isn’t as hard wearing as coated leather. So generally speaking, you don’t need to worry about the ‘type’ of leather in your car. It's going to be hard wearing and any dedicated leather cleaner won't damage it. 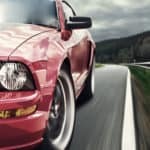 How To Choose the best car leather cleaner? There are literally hundreds of options when it comes to leather cleaning products. Some make false promises and some won’t be all that effective. So when it comes to choosing the right one it can often be trial and error until you hit on one you like. Here are few things to consider before you lay down your hard earned cash. 1. What’s the price per gallon/ltr? This is probably one of the most important factors if you don't already have a 'favourite' product. You should try and clean the leather once a month, so depending on the size of your car it may be more cost effective to buy in bulk. 2. Is it PH Neutral and does it contain harsh chemicals? To be honest, I've yet to come across a leather cleaner that isn't PH Neutral, and what constitutes a 'harsh' chemical can be subjective. Anyway, there are products out there that are made from 'natural' oils and some people prefer these to man made chemicals. Neither will damage your cars' leather, but some will be more effective than others. 3. Is it a cleaner and conditioner in one? If you fall into the 'leather conditioner is a waste of time' camp, then you can save a few dollars by just sticking with a good cleaner. Cleaner and conditioner combos are handy if you are in a hurry and don't want to totally eliminate the conditioner from your cleaning routine. I usually go for the separate cleaner and conditioner. I don't always condition, but I like to apply it a couple of times a year. It makes me feel better, and I like the smell! 4. Is it generally easy to use and apply? I've yet to come across a cleaning product that isn't easy to apply. I suppose if it's in a bulk sized container you may need to use a spray bottle. Some cleaners will won't be as strong as others so you may need to repeat the process a few times to get lighter colored leather really looking clean. It's also worth noting that you need to leave some conditioners for a few hours after you have finished before you can sit on them. 5. Will it leave behind a scent or protective coating? This one is totally subjective. Some people like the fake leather smell, and some people prefer their leather to smell of fruit! As far as the protective coating goes, your leather doesn't need it. If the leather is worn or damaged it's not going to provide any long term protection. It will only make it harder to clean the next time. One of the best ways to ensure the leather in your car stays looking new, is to clean and condition it regularly. If you have the bought the car new, then it's even more important to treat it as soon as you can and again at regular intervals. Looking after the leather in your car is a simple 3 step process of cleaning, conditioning and protecting. If you follow this simple procedure, the leather in your car should stay looking new for years to come. Before you can protect the leather, it's important to clean it thoroughly using a PH neutral, safe leather cleaner. This is a really important step, as it removes all contaminants (oils, dirt, stains) and restores the leather back to the factory finish. Start by taking a clean microfibre cloth (or soft bristle brush if the leather is really dirty). Apply a small amount of car leather cleaner to the cloth and gently rub it into each seat in a forward and backward motion. Reapply the leather cleaner to the cloth for each seat section, and rub it gently until all oils and dirt are removed. When clean, the leather surface should be matt and dry, with no oily residue present. Don't forget to clean other leather surfaces such as steering wheels, armrests and door cards. 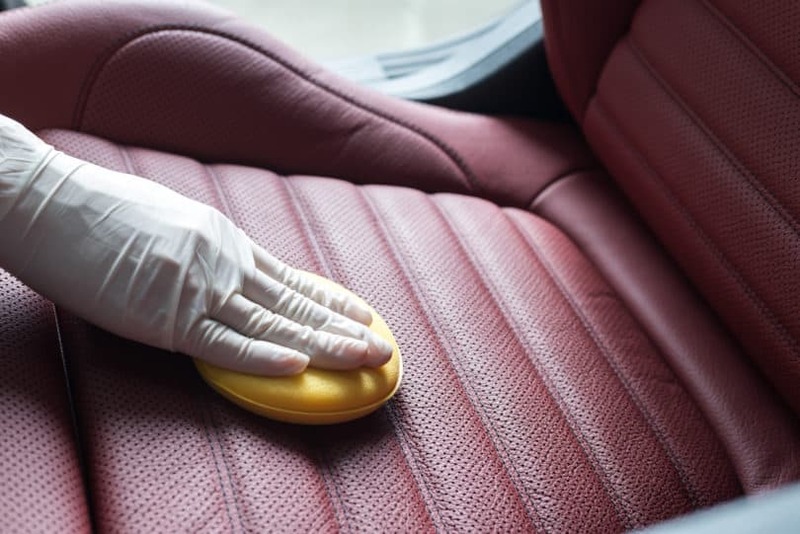 The next stage of the process involves applying a car leather conditioner that will restore the soft, suppleness of the leather and help protect it from everyday wear and tear. To condition the leather, take another clean microfibre cloth and apply a small amount of car leather conditioner to it. Gently spread the conditioner across the entire seat surface so that it leaves the surface looking wet. Then fold over the cloth, and rub the conditioner into each part of the seat so that is worked into every part of the surface leaving behind very little excess. When done, the leather should look silky and clean in appearance (not too wet, too wet means you have used too much conditioner). If necessary, take a clean microfibre cloth, and rub it over the leather to remove any excess conditioner. Some leather conditioners need to be left for a few hours to soak in to the leather, so it's worth leaving them for a while before moving on to the next step. If you want the ultimate protection for your car leather, then periodically applying a car leather sealant (or serum) is the way to go. A car leather sealant will help to protect the leather from UV rays, exposure to weather (if it's a convertible) and protection from wear and tear, especially if you've got kids and dogs! Some people use a conditioner and no sealant, and some use both. The conditioner will help to keep the leather supple and prevent cracking, whilst the sealant will protect the leather from drying out. Applying the sealant is really easy, just like applying the conditioner. Take a clean microfibre cloth or pad and apply a small amount of sealant to it. Then rub the sealant into the leather surface until there is no excess product visible. When fully applied, leave the sealant to dry out for a few minutes so it can bond to the leather surface. Then take a clean cloth a gently rub it over the leather to remove any excess sealant that has not dried in. When fully dried a good leather sealant will leave a matt leather finish with that new leather scent. With a little bit of care and attention, it's really easy to keep your car leather looking new for a long time. Here are a few tips for making sure the leather stays in tip tip condition. Removing any dirt or oils from the leather on a weekly basis, will help to protect it from damage and cracking. Leather is a porous surface and it will easily attract any dirt from your clothes and hands, absorbing it into it's pores and leaving it looking dirty and old. Use a good quality leather cleaner regularly to keep the leather looking like new. Regular cleaning also means you don't have to rub the surface as much to get it back to factory condition, reducing the wear on the leather surface. If you can treat the leather surface with a conditioner and sealant a couple of times a year, you will greatly improve the chances of it staying in good condition. A sealant will help to stop the leather absorbing any liquids and will protect against UV rays. A conditioner will help to keep the leather surface supple and soft. Don't be tempted to choose cheap quality or homemade leather cleaners, you'll only do more damage to the leather in the long term. Only choose neutral, water based products that won't harm the leather surface. Apart from when you are cleaning the leather, try not to let it get too wet. This is especially relevant if your car is a convertible. Wet leather will stain and crack if left untreated. Wet leather will lose its natural moisture as it dries out, and if this is a regular occurrence, it will eventually lose its suppleness and will crack. So if you accidentally leave the roof down during a rain shower, make sure you dry off the leather as soon as possible and apply a good quality conditioner from time to time. It probably goes without saying, but before you try out a new leather cleaner product, make sure you try it out on a small, hidden area first. Some leather conditioners and sealants take a few hours to dry out fully and leave behind the final surface finish. It's important that you try out the product in an inconspicuous place first so that you are happy with the final look of the leather.